For this week’s challenge we’d like you to choose a photo that is photojournalistic in style. Or (for this week only) you can enter a collage of photos instead. Please make sure that a human face is showing up somewhere in your photo entry and that you use only a maximum of 5 photos in your collage. Our definition of Photojournalism for the sake of this challenge: Using an image (or images) to tell a story. This is my first challenge ever for I heart faces. :) Its a pretty great challenge to start off with. I just recently Volunteered to take photos for an Amazing program, Called the Back to School Project. They help family's provide new school clothes, shoes, backpacks and some school supplies for their children. It was such a wonderful event, and I was so happy to be there and be apart of it. It started at 5:30 in the morning to about 10:00 AM. For the first few hours I just went around taking photos, and the last hour I actually got to walk around and help one family shop. I helped 2 young boys with their dad, and they were just adorable and very funny. The very top picture here is the line of volunteers, waiting to be partnered up with a family. Underneath that to the left, that little girl's smile just caught my eye, she just looked so excited to meet her volunteer, and be there to do some school shopping! 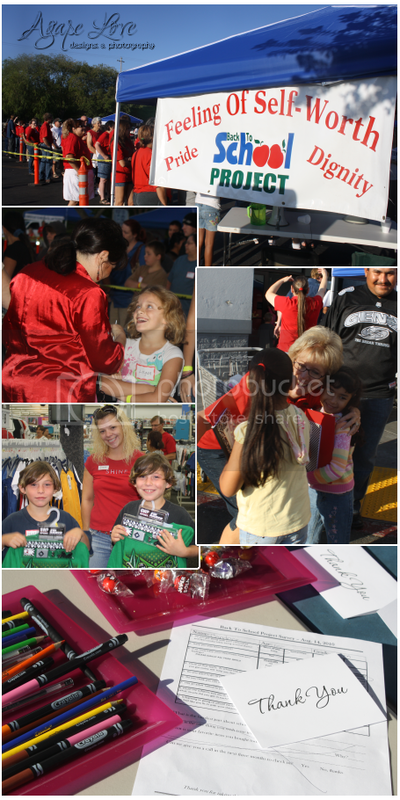 Each Volunteer was given a $100 gift card for each kid, and was to help them shop and keep track of the cost. Below that picture, you see twin boys shopping with their volunteer, and next to that you see two precious sisters hugging their volunteer after all the shopping is done, and they received their free school supplies. And lastly at the bottom, the kids had a chance to sit, have some candy and make a thank you card. I love events such as this. it's the little things that make such an impact on kids. You can see the joy in their faces! Great first entry! Great shots and a great project! Well done on your first entry at I heart faces. So lovely! Great choice for this week. XO! What a cool event. Great pictures. Oh how sweet. Great shots, great job!!!! what an awesome event to be a part of and capture in such a beautiful way! great 1st entry ans welcome to the community.. i'm kinda new myself and my favorite part is getting the feedback from so many very talented people! i look forward to your future posts! :) God bless. Great event and fantastic pictures! Love everyone's expressions.